Hundreds of public media leaders gathered in Salt Lake City for a CPB Public Media Thought Leader Forum at the 2019 National Educational Telecommunications Association (NETA) Conference earlier this year. The second annual forum connected attendees with leaders from business, philanthropy and education to reinvigorate public media’s educational content and services through innovation and engagement with new audiences. Keynote speakers, interactive presentations and hands-on master classes helped station leaders explore new ways of thinking and engaging with their communities. After the 2018 Thought Leader Forum, CPB awarded 50 education innovation planning grants to help stations take the first steps to turn ideas into action. At this year’s forum, general managers Vickie Lawson of East Tennessee PBS and Tom Axtell of Vegas PBS, along with Rhode Island PBS Education VP Jon Rubin, described how they used their grants in response to needs expressed by their statewide and regional audiences on projects including video ACT tutoring, a curriculum on water conservation and an educational virtual reality field trip. Among the speakers were anthropologist Nat Kendall-Taylor of the FrameWorks Institute and museum director Nina Simon, author of “The Art of Relevance.” They made dynamic presentations about effective communication and community engagement, followed by master classes for participants to develop practical applications. 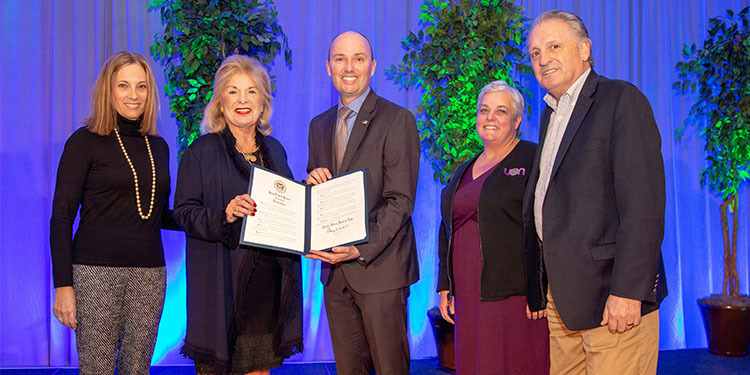 Recognizing the countless contributions public media stations have made to our nation’s civic life, Governor Gary Herbert declared a Public Media Week in Utah. Lt. Governor Spencer Cox presented the proclamation to CPB along with host stations KUED and the Utah Education Network. The Lt. Governor thanked the gathering of public media professionals for their work and spoke about the impact of public media on the country. “We need public broadcasting to bridge the gap and remind people of shared facts. We can’t afford to lose you,” he said. Keynote speakers Tim Shriver, CEO of Special Olympics and chairman of CASEL (Collaborative for Academic, Social and Emotional Learning), and Sarah Smarsh, best-selling author of “Heartland: A Memoir of Working Hard and Being Broke in the Richest Country on Earth,” both addressed the hardening of political divides in this country and the important role public media can play in bridging that divide. Shriver pointed out that people across the country are deriving their stories largely from the media rather than personal experience. She spoke about the collapse of local news, making rural places all but invisible in mainstream media. Smarsh noted the importance of having an on-the-ground presence to report on and from these places with deeper understanding of local issues and culture. She praised public media for getting deeper stories beyond the soundbites and affirmed the importance of non-commercial educational programming for viewers like her father, who tuned in to public television because it was free and discovered its educational value. “There is no more important work than what those in this room are doing,” she said. Panel discussions focused on ways public media producers are reaching younger audiences. WOSU Chief Content Director Nick Houser, ideastream Chief Content Officer Mark Rosenberger and ThinkTV Chief Education Officer Gloria Skurski described the collaboration on “Talking Jobs With Ohio’s Next Governor” a first-of-its-kind digital forum for youth to ask gubernatorial candidates about education and job creation. This pre-election digital forum was a product of American Graduate: Getting to Work grants, which all three stations received from CPB. Executive producers Ellen Doherty of Fred Rogers Productions, Adnaan Wasey of WGBH and Annelise Wunderlich of KQED Education talked with moderator Myles Bess, host of the KQED/PBS Digital Studios YouTube series “Above the Noise,” about the importance of balancing educational content and engaging younger audiences through digital media. Feedback from Forum participants described how it provided inspiration and a renewed sense of purpose. “The format of this conference really connected with our team. The speakers were connected to our challenges and opportunities,” observed Jack Galmiche, President and CEO, Nine Network. Videos from the 2019 Public Media Thought Leader Forum are available on YouTube and on NETA’s Facebook page.